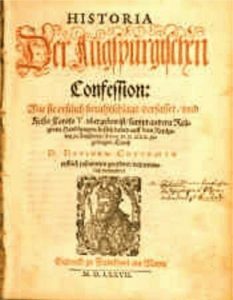 Introduction: Sunday June 25th marks the 487th anniversary of the Presentation of the Augsburg Confession for Charles V. The Augsburg Confession is the primary confession of faith of the authentic Lutheran/Evangelical Church and one of the most important documents of the Lutheran Reformation. The Augsburg Confession was written in both German and Latin and was presented by a number of German rulers and free-cities at the Diet of Augsburg on 25 June 1530. Emperor Charles V called on the princes and free territories in Germany to explain their religious doctrine in an attempt to restore religious and political unity in the Holy Roman Empire and rally support against the Muslims who were threatening the West. Theologically speaking, the Presentation of the Augsburg Confession was the high point of the Reformation. “God” is Father, Son, and Holy Spirit. “Original Sin” All are born and captive to sin from conception. That is we are born without proper fear of God and without trust of God. III. “Son of God” Jesus Christ fully human full divine, one person and two natures. “The Office of Ministry” To obtain such justifying faith God instituted the office of the ministry, that is, provided the Gospel and the sacraments through the work of the church in the means of grace God gives the forgiveness of sins and the Holy Spirit. “New Obedience” good works of the Christians are the fruits of faith and salvation, not a price paid for them. True faith produces good works. VII. “The Church.” The assembly of all believers among whom the Word of God is purely preached and sacraments administered according to the Gospel. VIII. “What is the Church” The place were hypocrites and true Christians are found. Despite the presence of hypocrisy, the Word and the Sacraments are always valid because they are instituted by Christ, no matter what the sins may be of the one who administers them. “Baptism” gives the grace of God and the forgiveness of sins. Children are baptized for they need what baptism gives. “The Lord’s Supper” is both bread and wine and the body and blood of Jesus Christ and gives forgiveness of sins to the contrite who believe what Christ gives therein. “Confession.” Private confession and absolution are to be retained among Lutherans. XII. “Repentance” true repentance is nothing else than to have contrition and sorrow, or terror, on account of sin, and yet at the same time to believe the Gospel and absolution (namely, that sin has been forgiven and grace has been obtained through Christ), and this faith will comfort the heart and again set it at rest. XIII. “The Use of the Sacraments” The sacraments are physical manifestations of God’s Word and His commitment to us. The Sacraments are never just physical elements, but have God’s Word and promises attached to them to create and strengthen faith. XIV. “Order in the Church” Nobody should publicly teach or preach or administer the sacraments in the church without a regular call. “Church Usages” Church festivals, calendars, and rites are useful for religious observance, but that observance and ritual is not necessary for salvation. XVI. “Civil Government” God has established two authorities in the world, each with its own jurisdiction. Secular governments and vocations are considered to be part of God’s natural orders. Christians are free to serve in government and the military and engage in the business and vocations. Laws are to be followed unless they are commandments to sin. XVII. “Return of Christ” The doctrine of the Last Things. XVIII. “Freedom of the Will” Man possess some measure of free will in the realm of “civil righteousness,” but has no power in himself in regard to spiritual righteousness, that is to please God and make himself or herself acceptable to God. XIX. “Cause of Sin” is a perverted will and the devil. “Faith and Good Works.” We are saved by faith, not works, but faith creates good works, and works done in faith are pleasing to God, and good works are products of Christ’s dwelling in us. The doctrine of justification by faith does not condemn good works. XXI. “The Cult of the Saints” All who believe in Christ are saints by faith. Saints are to be honored and respected, but not worshiped and they are not intermediaries between God and man. XXII. “Both Kinds in the Sacraments” Bread/Body and Wine/Blood should both be given in the Lord’s Supper. XXIII. “The Marriage of Priests” Marriage is commanded by God and prevents sin. God blesses marriage as an order of creation, and marriage and procreation is the natural outlet for human sexual desire. XXIV. “The Mass” is retained but only as a public gathering of the faithful for the purposes of worship and the receiving of the Lord’s Supper. Jesus is not sacrificed again and again in the Supper. He was sacrificed once and for all. Participation in the Mass is not a meritorious work that we do, but rather God’s work through which He forgives our sins. XXV. “Confession” Confession and examination are necessary before participation in the Lord’s Supper. Faith and a contrite heart are the necessary elements. XXVI. “The Distinction of Foods.” Human traditions do not hold the same authority as the Gospel and should not be forced upon the people. XXVII. “Monastic Vows” (human works) are not equal to the sacraments. God pleasing works are those done in faith and connected to a Christian’s particular station in life, vocation. XXVIII. “Ecclesiastical Power” The power of bishops in the church is not to be confused with the power of the state. The only power given to priests or bishops is the power given through Scripture to preach, teach and administer the sacraments. The powers given to the clergy in issues of government or the military are granted only through civil means. They are not civil rulers of governments and the military by divine right.